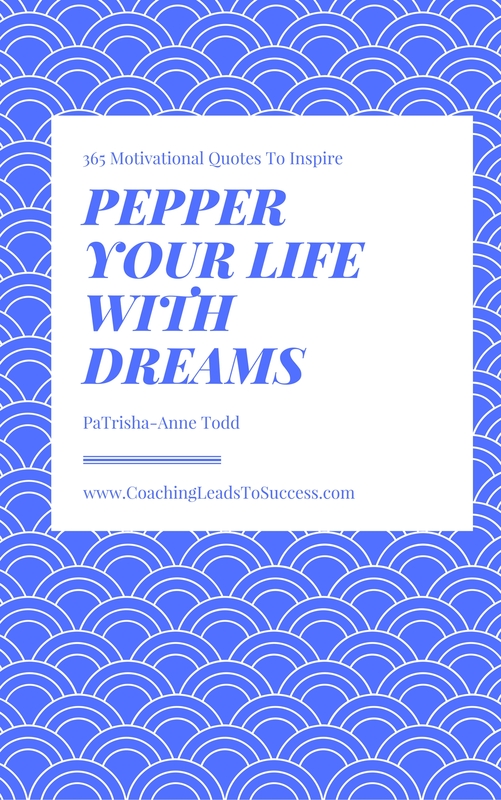 Pepper Your Life With Dreams - 365 inspirational quotes. Goodness me how true is that statement about your belief system steering you towards change. I mean without thoughts rolling around inside of your brain box you just wouldn’t change direction, you wouldn’t try out something new or simply create a truly satisfying lifestyle by design. Now a lifestyle by design is what my core belief system prompts me to work towards each and every day. By that I mean as soon as I wake I give thanks I’ve made it through another night and that I have the opportunity to take action towards my goals – hence my quote ‘Today Is Preparation For The Next Opportunity’. You see without knowing what my ‘why’ is and why I want to manifest a specific outcome, or know why I need to take a certain course of action or being able to see the desired outcome happen before my very eyes I wouldn’t understand how best to pace my day towards achieving my specific goals. I need to know ‘why’ to allow myself to get to goal. To do that, to get to goal I pace myself. I review what I want to achieve and then assess my current reality. In other words, I remind myself what I want, but look realistically at what the day ahead needs to happen and the resources around me. Once I’m clear on those important elements I can adjust what I do towards achieving my desired outcome at a pace that leaves me totally inspired to continue reaching for that goal. I know for a fact that within the concept of Life Coaching it’s not necessary to be an expert in all that one does. Only to be clear on the goal and realistic to making change happen, then to add in the courage to make the change effective, doable and permanent. With those steps in place you’ve got a steady and realistic movement towards the desired outcome. Basically, this means taking one step at a time towards goal achievement on a consistent basis. There is no need to go over the edge by taking risks or to delve into adverse actions, such actions will only lead to overwhelm, stress, worry and an unnecessary waste of time. Simply know what you want, review what you have and what you can do today as part of s-t-r-e-t-c-h-i-n-g your comfort zone towards goal achievement. Then choose five actions you can do today towards reaching your desired goal. Choose action steps that allow you to s-t-r-e-t-c-h and make a positive progression forward. As you carry out each of those chosen action steps reward yourself with verbal praise as an encouragement towards continuing along this route. Don’t stop, keep going and see how each forward moving action you take brings you closer to your desired outcome. This is preparation for the next opportunity. It’s your belief system that steers you towards change.